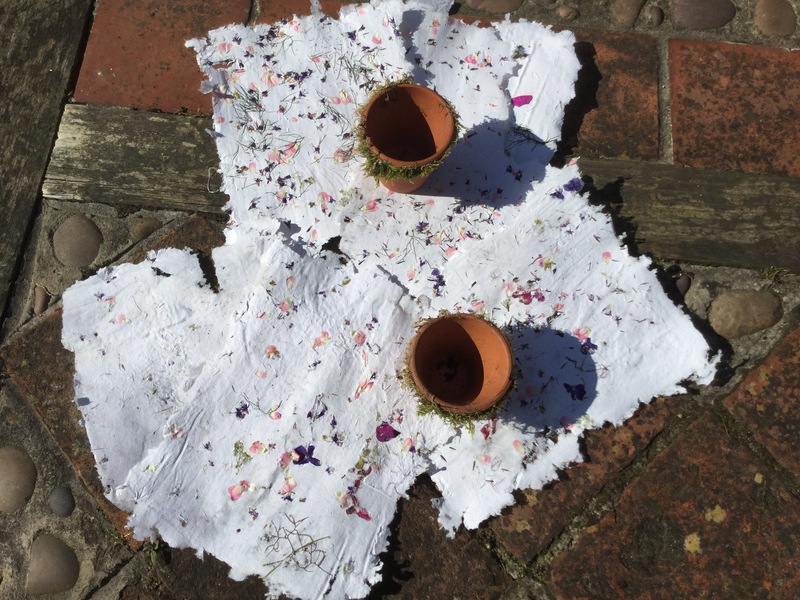 This first experiment in paper making was to try and make interesting hand made paper that could then be made into greetings cards, invites, gift tags or bookmarks. I wanted to embed seeds into the paper so that it could be recycled again with a floral result. First you take perfectly good paper and rip it into small pieces! Actually it was scrap paper, some old worksheets from lessons that were out of date. You can use old envelopes, newspaper, wrapping paper, brown paper bags etc, but I wanted a fairly clean result so that I could try printing onto it as well so I used ordinary A4 sheets with just a little print on them. 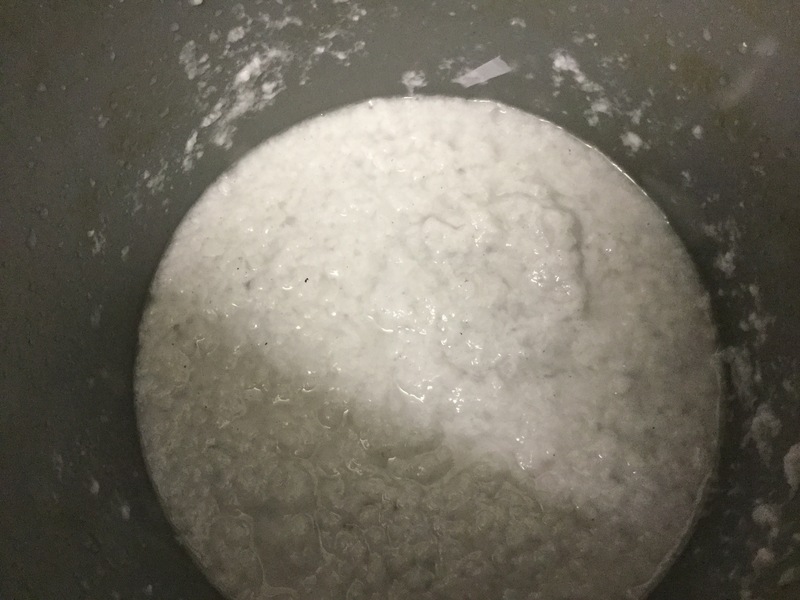 I soaked the torn pieces in hot water for a couple of hours then blended them using a hand blender, the result was a bucket of white mush. I made a small frame from oddments of wood and stretched an old piece of net curtain over it stapling into place. 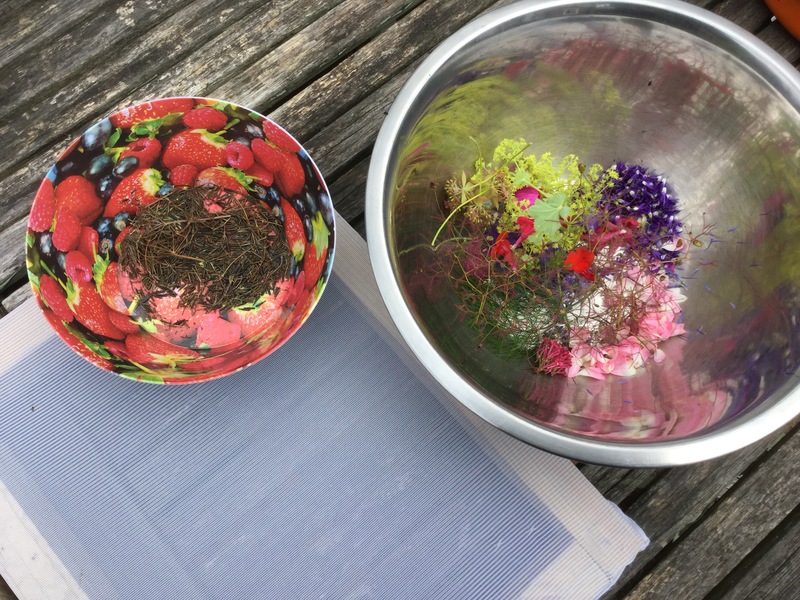 Then I added more water to the mush and collected flowers, petals and seeds from the garden. 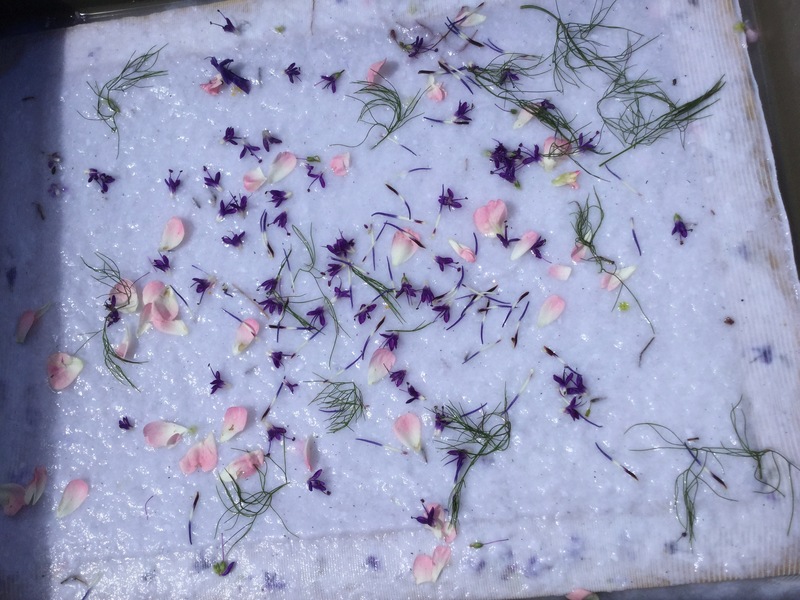 After dipping the screen into the paper pulp mix and adding some flowers and seeds I then turned it over onto a piece of scrap fabric, it was important to sponge the back of the paper through the screen to remove excess water before carefully removing the screen. The paper was left to dry in the sun for a few hours before carefully removing from the fabric. The results were encouraging, pretty pieces of hand made paper that would make lovely gift cards, greetings cards, invites or just for sending a special message, He best thing is that if you lay it onto compost and water, you will have an extra surprise of seedling Anthriscus sylvestres ‘Ravens Wing’, commonly known as purple cow parsley.